On another website, the owner of the above tree has claimed that John Edmumd Miller Russell is her ancestor. All the data in relation to his birth and death is the same except that John’s name has been changed to John Edward Miller Russell. This John Russell is said to have married Catherine Miller and lived in Armidale, NSW where they had at least seven children. The claim that this John Russell was born on 28 April 1843 in Cheltenham, Gloucestershire, son of Richard Artus Russell and Ann Miller, and died in Sydney on 9 August 1929, is simply incorrect. 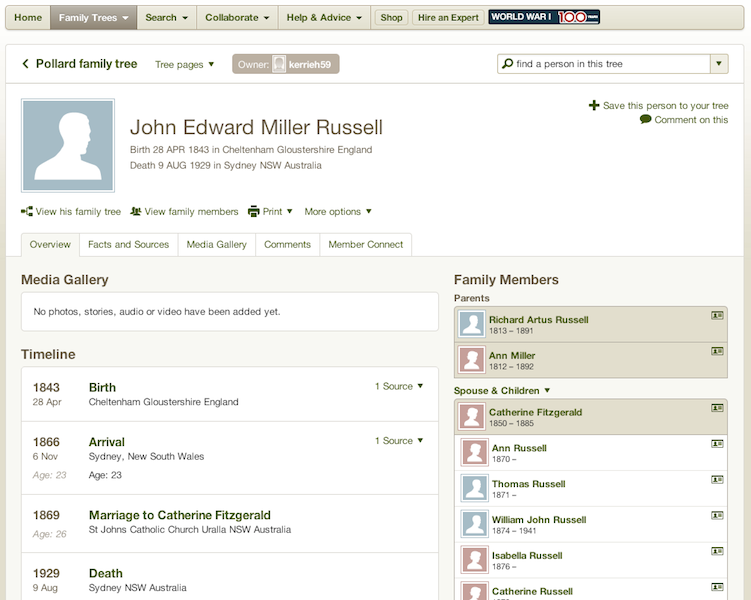 John Edmund Miller Russell’s story on my website has too much evidence to support his marriage to Mary Ann McClean and his life in Sydney.